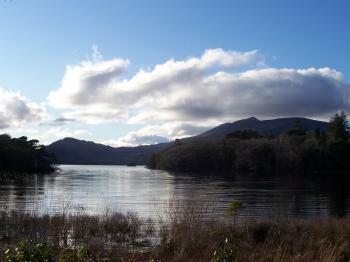 Killarney National Park has been part of the Tentative list of Ireland. I truly believe that this tentative site has the potential to become a WHS if grouped with some boglands as it is truly unique and unspoilt. The two times I have been in this part of South West Ireland, I have been blessed with great weather and it has made my trips hugely enjoyable. The lakes and hills of Killarney National park are one of the greatest treats of County Kerry, offering magnificent views. In February 2009 I had a great day driving around some of the main sights. The Torc waterfalls were our first stop, and very worthwhile. We also visited the grounds of Muckross House which sloped down to the lake front. We carried on a really rewarding drive enjoying the vista at Lady�s View. The best base for the National Park is probably the town of Killarney, however I found it hard to like, though it has all the infrastructure for tourists it seemed to revel in pedalling clich�s about Ireland, and wasn�t a great reflection on what is one of the nicest parts of the country. If you have your own transport then I would recommend basing yourself elsewhere such as Kenmare. I am not sure if Killarney would really add much to the World Heritage list, it is already a biosphere reserve so is pretty well protected. However it is a truly lovely part of Ireland and well worth spending some time exploring, especially if you would like to combine it with a trip to the magnificent Skellig Michael, and a more extensive trip on the ring of Kerry.